Also serving communities of Southaven, Holly Springs. There are 25 Assisted Living Facilities in the Olive Branch area, with 3 in Olive Branch and 22 nearby. The average cost of assisted living in Olive Branch is $3,560 per month. This is higher than the national median of $3,346. To help you with your search, browse the 202 reviews below for assisted living facilities in Olive Branch. On average, consumers rate assisted living in Olive Branch 3.9 out of 5 stars. Better rated regions include Germantown with an average rating of 4.5 out of 5 stars. Caring.com has helped thousands of families find high-quality senior care. To speak with one of our Family Advisors about assisted living options and costs in Olive Branch, call (855) 863-8283. Olive Branch, Mississippi, is home to historic Olive Branch Old Towne. This area's regular events provide opportunities for seniors to get to know the local community and have fun. At the weekly Hootenanny, seniors can relax and listen to old-fashioned music. Within this quaint area, there are 39 Assisted Living Facilities (ALFs), including two in Olive Branch itself. These ALFs are regulated by the Mississippi State Department of Health (MSDH) and offer personal care services such as assistance with activities of daily living and medication management. Seniors with a respiratory illness are in luck in DeSoto County. The American Lung Association gave this county an Ozone rating B for air quality. Poor air quality can have adverse effects on those with lung conditions. The low rate of crime in this area may help seniors feel safe and secure when running errands or going to appointments. Olive Branch has a violent crime rate of 19.7 (1 being the lowest) compared to the national average of 31.1. Property crime in Olive Branch is 34.6, just below the national average of 38.1. Seniors on a budget are able to save money in Olive Branch. As the cost of living in is 10 percent lower than the national average, seniors may be able to afford better quality care or have more cash on hand for entertainment. Olive Branch experiences an average of two inches of snow and a cool 30-degree average low in January. Seniors able to endure the cold are greeted with sunny July highs of 90 degrees in the summer, perfect for those who love the outdoors. The Olive Branch area is home to world-class medical facilities, including Methodist Olive Branch Hospital, in the event of medical emergencies or illness. Retirees and seniors in Mississippi enjoy several tax benefits. As social security checks, 401(k) and IRA income are tax exempt seniors have more money to enjoy life and take care of daily needs. Assisted Living costs in Olive Branch start around $3,560 per month on average, while the nationwide average cost of assisted living is $4,000 per month, according to the latest figures from Genworth’s Cost of Care Survey. It’s important to note that assisted living rates in Olive Branch and the surrounding suburbs can vary widely based on factors such as location, the level of care needed, apartment size and the types of amenities offered at each community. 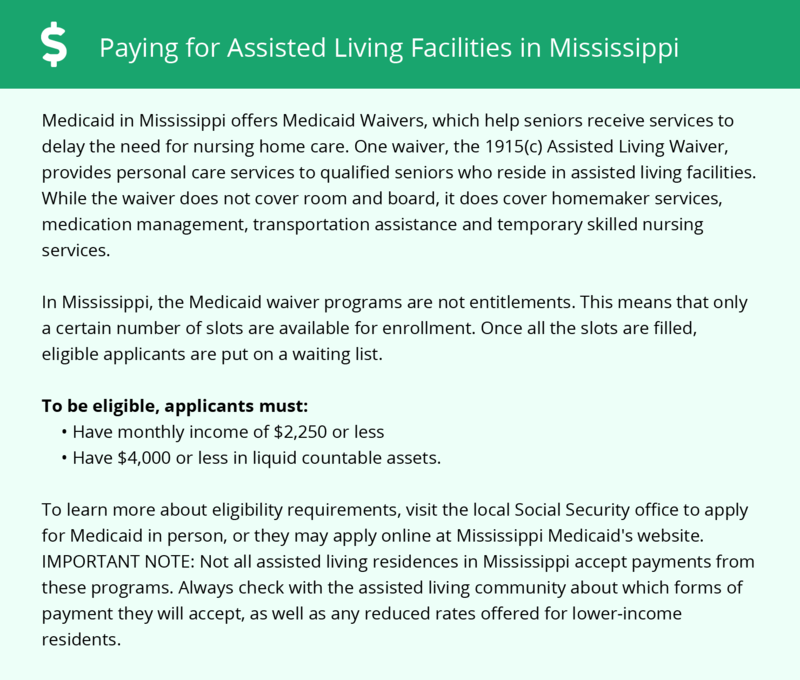 Seniors seeking financial aid for assisted living costs may be eligible for coverage by the Mississippi Division of Medicaid. The state’s Medicaid covers nursing services and some personal care services. 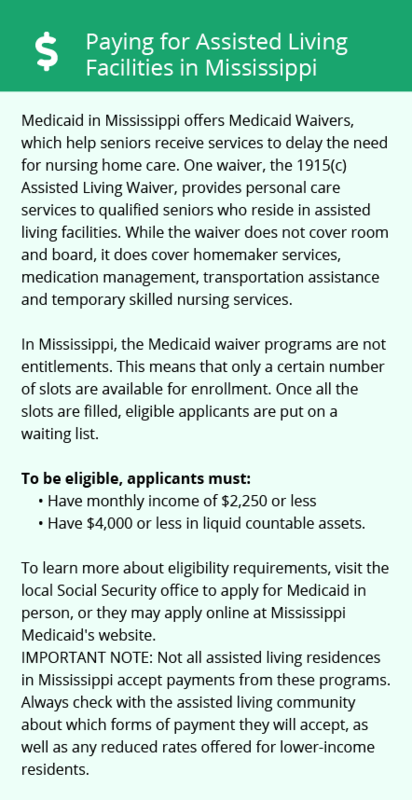 Seniors can also apply for three Medicaid waiver programs for further assistance. At this time, there are no non-Medicaid programs for assisted living aid. Learn more about these programs, plus who’s eligible, on our Assisted Living in Mississippi page. For more information about different ways to finance assisted living, visit our Assisted Living in Mississippi page. Olive Branch and the surrounding area are home to numerous government agencies and non-profit organizations offering help for seniors searching for or currently residing in an assisted living community. These organizations can also provide assistance in a number of other eldercare services such as geriatric care management, elder law advice, estate planning, finding home care and health and wellness programs. To see a list of free assisted living resources in Olive Branch, please visit our Assisted Living in Mississippi page. Olive Branch-area assisted living communities must adhere to the comprehensive set of state laws and regulations that all assisted living communities in Mississippi are required to follow. Visit our Assisted Living in Mississippi page for more information about these laws.